UND President Mark Kennedy says UND can play a key role in helping to produce skilled employees for occupations and industries that are experiencing critical workforce shortages. Photo by Shawna Schill. When the going gets tough, the tough get growing. As North Dakota faces declining oil and ag prices and tough economic times, growing the state’s talent pool, which produces skilled workers needed to reverse shortages in key industries, is one way to kick-start the state’s economy and get it humming again. UND is in prime position to influence the next growth spurt, according to UND President Mark Kennedy. Keith Lund, vice president of the Grand Forks Region Economic Development Corporation, doesn’t need any convincing. He said UND and the North Dakota University System have a proven track record supporting the growth of North Dakota. “The No. 1 talent [producer] in our region is UND,” Lund said, “and the same can be said for the rest of the institutions in the state.” With strong programs, he said, they can continue to educate people who are key to filling job opportunities across the state. One way to help the state grow, Lund said, is to continue to expand research engagements with industry, collaborations with corporations, and student internships. 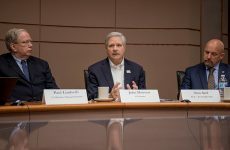 For example, he said, large defense contractors have said that talent provided by UND and Northland Community and Technical College in nearby East Grand Forks and Thief River Falls, Minn., is one of the reasons that they have located in the area. Other examples include Brady Martz, a large accounting firm that has offices all over the state. 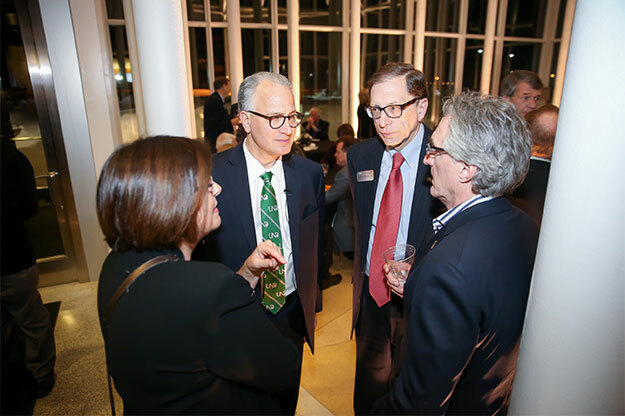 UND Interim Vice President for Student Affairs Laurie Betting (left), UND President Mark Kennedy and UND Vice President for Health Affairs and Dean of the School of Medicine & Health Sciences Joshua Wynne discuss topics important to UND and the State of North Dakota with North Dakota Gov. Doug Burgum on Tuesday during a North Dakota University System reception at the Heritage Center in Bismarck. Photo by Shawna Schill. Margaret Williams, dean of the UND College of Business and Public Administration, says UND is squarely aligned with the employment needs of North Dakota. “If you look at the list of in-demand occupations from Job Service North Dakota, you will see that UND offers nearly every major on that list,” she said. Along with meeting current needs of the state, entrepreneurship that stems from UND has the potential to grow new industry and services. UND’s massive research enterprise also is big for the state. The University’s work in chemical engineering can increase output in refineries, develop new kinds of fuels and renewable energy, and even find new compounds to disinfect hospitals. New ideas include more than generating jobs. It also entails serving the needs of North Dakotans. With opioid drug addiction skyrocketing in the state, UND offers a specialty track in addiction counseling and is preparing counselors to reach people in critically underserved areas across the state. Forty-seven counties in North Dakota don’t have the required amount of mental health care available, said Cindy Juntunen, dean of the UND College of Education and Human Development (CEHD), home of the UND Counseling Department. “We provide 15,000 hours of free to low-cost mental health services per year,” Juntunen said. “There is a health professional shortage across the state,” Juntunen said, adding that the Counseling Department provides mental health counselors, school counselors and other professionals. 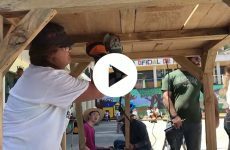 Training professionals in North Dakota increases the chances they will stay in the state, she said. Along with counseling, the CEHD provides programs in every teacher-shortage area, and has made major investments in meeting the needs of rural schools. Gayle Roux, dean of the UND College of Nursing and Professional Disciplines, takes that commitment and extends it to the healthcare needs of everyone in the state. 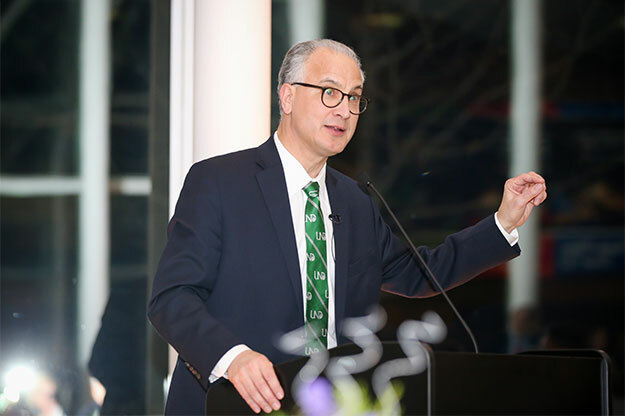 “UND is preparing nurses, social workers, dietitians and nurse practitioners to help keep an aging population well, prevent and treat high-risk problems such as drinking and substance abuse, and increase the quality of life,” said Roux. The University also is working to address healthcare shortages, which includes nurses, nurse practitioners, social workers, physicians and more through the UND School of Medicine and Health Sciences (SMHS) Healthcare Workforce Initiative. The multi-year plan already has had a positive impact on increasing the number of physicians and healthcare providers who stay in the state. “The reason (physician) residencies are so important is that if a North Dakota student does a residency out of state, there is a one-in-three chance they’ll return to North Dakota,” said Dr. Joshua Wynne, dean of the SMHS. 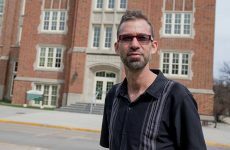 “If an out-of-state student does a residency in North Dakota, there is a one-in-two chance they will practice in the state. But if they go to UND for both medical school and their residency, there is a two-in-three chance he or she will practice here.